This is a compound of the truncated tetrahedron and its dual, the triakistetrahedron. Notice how each vertex of one sits above a face of the other, and that edges from each cross at right-angles in pairs. The points where they cross lie on the shared midsphere of the two polyhedra, i.e. the edges are tangent to the midsphere at those points. The model may be constructed in Great Stella by adding the truncated tetrahedron to its dual via the menu item "Poly>Add Base Model and Dual", or equivalently by going to the compound of base & dual view, and clicking the left-and-down button at the top of that view to use this compound as the new base model. Nets may then be displayed and printed. 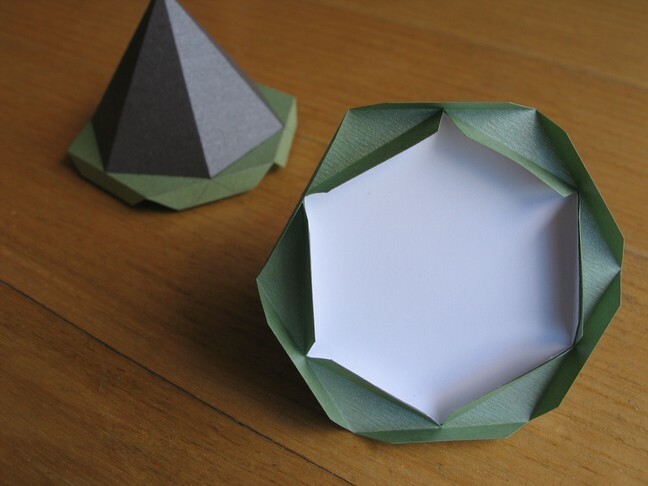 Here's a clever way to build a paper model, based on advice from Fr. 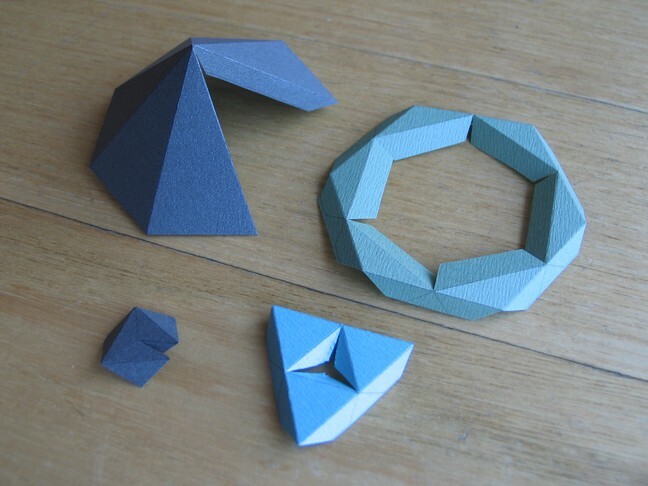 Magnus Wenninger's book Polyhedron Models. Firstly, just sticking pyramid tips onto the faces of either the truncated tetrahedron or its dual won't lead to the cleanest result. But pieces may be made as shown, with long tabs to hold parts together that only touch at a point in the final model. 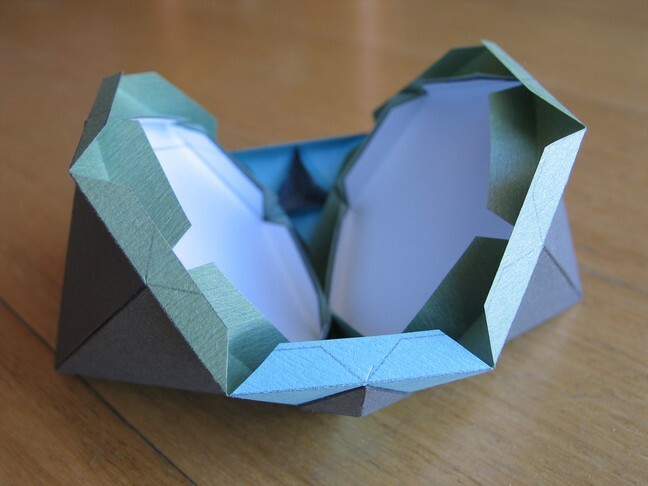 These tabs span across potential weak points in the model where edges of the two polyhedra cross, keeping them in alignment and strengthening the model. 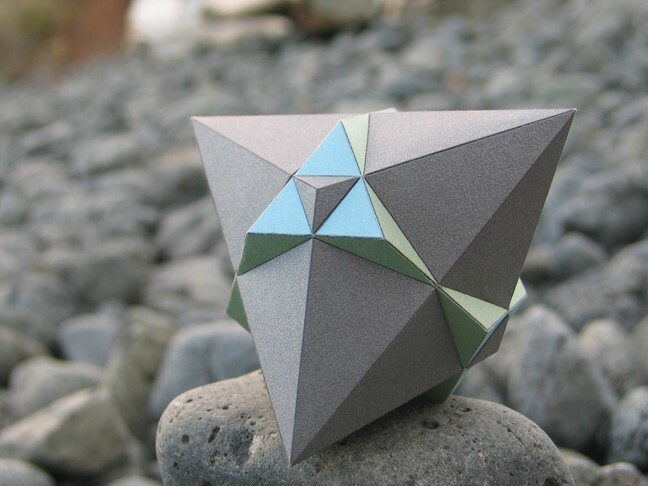 To print these hollow faces, start with the truncated tetrahedron and use "Poly→Subdivide Faces" with a value of 2 so that points are printed half way along each edge. I also printed smaller hexagons to fit inside and add further strength. But glue the dual's pyramidal peak in first. Finally just attach the sections together like faces of a truncated tetrahedron.